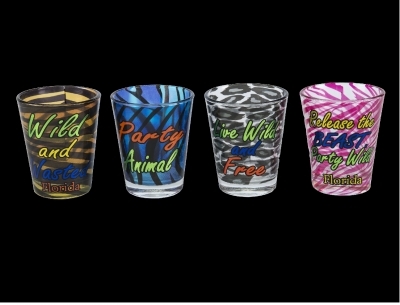 1464 Animal Print Shot Glass ... $ 18.00/dozen. CUSTOM IMPRINT AVAILABLE. 1446 Etched Rainbow Shot Glass. Tropical Design.....$ 21.00/Dozen. Custom Imprint Available. 1401 Bikini Body Shot Glass. Four Assorted Colors .... $ 24.00/dz. Custom Imprint Available. Heart Shaped Shot Glass. 3 Assorted Colors. 1164 Heart Shaped Shot Glass. 3 Assorted Colors .... $ 21.00/dz. CUSTOM IMPRINT AVAILABLE. Skull Shot Glass - 4 Assorted Colors. 1313 Tipsy Shot Glass ...$21.00/dz. 1308 Rainbow Shooter w/ Dolphin Decal ... $ 18.00/dz. CUSTOM IMPRINT AVAILABLE. Rainbow Flared Shooter Hibiscus Design - Assorted Colors. 1307 Rainbow Shooter w/ Hibiscus Decal ... $ 18.00/dz. CUSTOM IMPRINT AVAILABLE. Rainbow Flared Shooter Palm Tree Design - Assorted Colors. 1306 Rainbow Shooter w/ Palm Tree Decal ... $ 18.00/dz. CUSTOM IMPRINT AVAILABLE.